It struck me that the editors were being particularly sadistic this month! Following on from Shackleton’s masterful, but tricky, puzzle, we had Pointer, who could also be masterful and tricky. Those of you who had come across a Pointer puzzle before knew that they were in for another treat. His last puzzle (no. 4274, Conflict) needed the initial grid to be completely reorganised before submission. This week we had a carte blanche with cyclic clues which were all normal, although there would be some unclued entries. In the finished grid, one letter changing in each column would reveal examples of a keyword. Surprisingly, we were told the lengths of the new words that would be produced. The three clues at 1ac weren’t too helpful. The first, Plant that is abandoning Disney car (4) eluded me since Herbie was far too long ago for me to recall. The tent in the next part, Bully getting rid of bad tent (3), was probably GER or GUR, although neither giller nor goffer was in C. How remiss of me not to think of badger straightaway. The last part giving TASMAN, however, was pencilled in. Clues 2, 3 and 4 across were pretty easy, and I wondered why Pointer was being so generous. Rows 4, 5, 6, 8, 10 and 11 each had an unclued entry since the clues we were given didn’t sum to 13. I still managed to get at least one answer in every row, except 11 which looked a tad bizarre… Leak in rear section of tent; … (3) plus … hole starts here in front section; … (3) plus … boy cut both sections (4). The down clues were equally forgiving. Plus, with 1 MADRID ENEMA, 2 WINEY SPALES and 4 FALSE ROTHER, I managed to fix rows 2 and 3 and also fill in some of the other answers. I finished the grid in just over 90 minutes, including PEE, TEE and PETE at 11ac. I also liked the inventive clue at 8dn Similar characters coming together in Royal Lytham for golfer (3) for (Ernie) ELS. And so to the endgame. I tried to identify letters in the down columns that would reveal new words. I started at the right since that was where the (9, 9) indicated, although I suspected the answer lengths (3, 3, 4, 5, 5, 5, 5, 6, 6, 7, 7, 9, 9) weren’t in the right order. I failed miserably with this first attempt. I also kept wondering what “substitute one letter” meant. Did it mean “replace one letter with another” or “replace one letter with something else”, perhaps a foreign character or symbol. After about an hour of getting befuddled by this, I decided to flip the grid along the NW–SE diagonal so that the columns became rows. That might make the new words easier to spot. Five minutes later, I saw PALESWTINE in row 2, followed by NTEPAL in row 3, and I was off. Unfortunately, I couldn’t see any other geographical areas or countries in the grid — only a possible CERECHE and BAHBOOSH. Eventually I focused on finding the other 9-letter word and looked up words beginning with MAMA…, AMAD…, MADR…. I nearly missed MADRILENE, being distracted by the entry for Madrileño, but luckily saw it before moving on. Not that I was particularly impressed with a soup. I was beginning to wonder whether this puzzle would be my first failure of the year. It was headache time! Eventually I looked up Palestine in Chambers, but it only had Palestinian. Again I nearly overlooked what would be my salvation just below it where Palestine Soup was lurking, and this time I really was on the home straight. In order, we had the following synonyms or types of soup: MADRILENE, PALESTINE, LOKSHEN, BROTH, DUCK, BISQUE, POTTAGE, PEA, PHO, HOOCH, OXTAIL and RAMEN. What’s more, the replaced letters and the replacements used all the letters, to give us a complete Alphabet Soup. Cunning stuff! All that remained was to highlight the mysterious unclued entry “that describes all six” unclued entries. 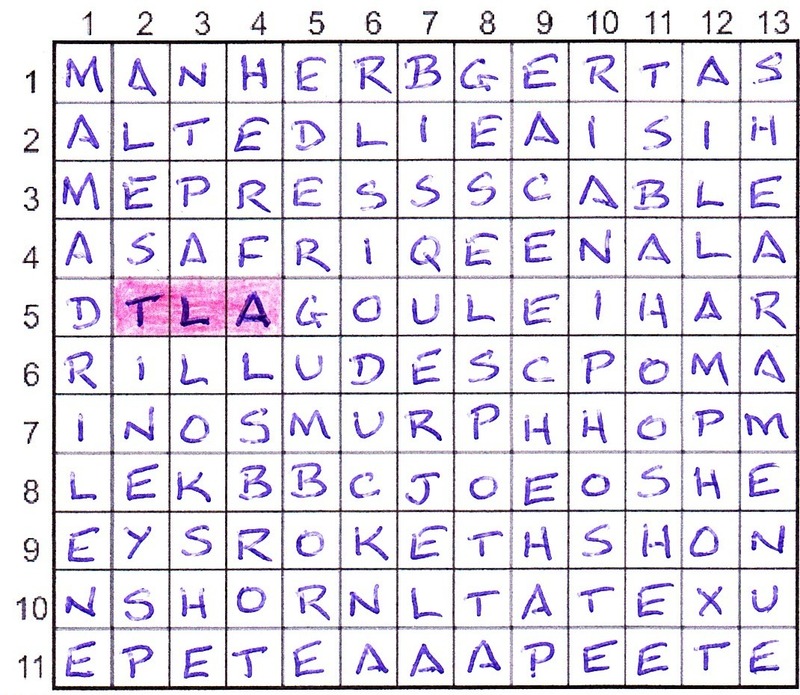 Of course, that turned out to be TLA, which had appeared in row 5, the three-letter abbreviation for Three-Letter Abbreviation… and The Listener Audience. I checked that the other unclued entries I now had were all abbreviations in Chambers: ASA, SCP, BBC, LTA and AAA. In the end, this one took me nearly five hours over three sessions. If only my French were fluent or I ate a lot of soup. Nevertheless, an excellent puzzle with a grid that must have been a right pain to get right. So thanks to Pointer for the headache, and thanks to the editors as well for two great puzzles in succession. This entry was posted on 21 May 2016 at 2:00 pm	and is filed under Solving Blogs. You can follow any responses to this entry through the RSS 2.0 feed. You can leave a response, or trackback from your own site. A tour-de-force of an animation, as usual. But I think you’ve somehow included OYSTER instead of PHO…? Thanks for the comment, Ben; I’m glad you appreciate them. I almost bit off more than I could chew this week and was beginning to lose the will to live towards the end! I hope the error didn’t make anyone think they got it wrong.